Kizmaru entered the arena once more for another battle in the chuunin arena. It wasn't an official match since he had already gotten his promotion but one with a Jounin from another village. This excited him a bit as he always wanted wondered how shinobi from other villages fought. He was told he could have the arena of choice and chose this one where where was a plethora of weapons spread out. A circular arena with a myriad of weapons strewn throughout a fifty meter diameter arena. This was his ideal arena since he didn't really have much as to go on offensively previously, though his Taijutsu alone was quite formidable during a couple of rounds. Either way, Kizmaru walked towards the center of the ring scrounging up any weapon he view as decent or easy to use. He was proficient with spears and axes so he took picked up a great axe to compliment what he was good at. Along the way, he had picked up five kunai and three shuriken, adding them to the ones he had already brought in with him for the battle. Equipping and readying the great axe he found, Kizmaru looked around once more to see if he could find anything else that may be of use to him in the near future. He spotted a few choice weapons in case the axe wasn't working out for him or broke in the midst of battle. Keeping the weapons in mind, he had focused his attention on his would be opponent whenever they would make their appearance. The day had been rife with bouts. He had been fighting, by his own choice, in a seemingly endless stream of matches since sun up. The crowds that had gathered in the stands were fewer than the exams, but still plentiful in their own right. Now it had finally come time for his last match for the day-- and the exams themselves at that. Donning the typical garb of a Konoha Jōnin, the dull thudding of his atypical boots treading across concrete echoed throughout the empty corridor as they carried him onward into the arena. Bathed in the early evening light as he stepped past the final arch, eyes black as coal washed over the arena of choice. It was little more than a barren field of weaponry of every shape imaginable strewn about haphazardly for the contestants to utilize however they saw fit. Swords, staffs, projectiles, even arrows, it was a specialist's dream. Unfortunately, Takao's talent did not rest with the usage of weaponry. Convenient as it was, their presence was little more than aesthetic. He would use his own weapons if needed, but he felt confident in his assessment that he could manage without. He continued forward, further into the arena, properly surrounded by the myriad of weaponry that gave the arena its theme. His gaze fell onto his opponent now, examining their appearance as well as the weapon they held in their hand. A large axe, properly inefficient for fighting any opponent who held dominion over speed, but an interesting and unique choice nonetheless. Many shinobi opted for a slipshod gimmick, after all, it wasn't so uncommon to bring on harshly critical musings. "You can have the first move." He said. No weapons in hand, none visible on his person at a glance as well, arms at his side, and eyes unwavering from his opponent, Takao's legs tensed in preparation. There was no need for pleasantries before the fight. They both knew why they were there, and if he felt the need to afterward, he would do so. But, for now, his head prepared for the fight. Watching his opponent walk into the arena, Kizmaru gripped his great axe tighter. This was the only time he would get to carefully observe him. There didn't see to be anything special about him at first glance, no modifications, no weapons in hand, nothing that indicated he had used any jutsu thus far. It didn't seem like he have any interest in the weapons currently in the arena either. Most likely means, he had a hefty sum of jutsu in his arsenal which unfortunately puts Kizmaru in a disadvantage. No matter. He'd just do what he can with what he was currently given and make do. When the opponent got into his position, he had told Kizmaru, he was allowed to make the first move. Of course, this was a trap if Kizmaru ever saw one and decided he'd play it cautious. He was roughly twelve meters away from Kizmaru which was what he considered to be safe enough for long ranged attacks. Resting the axe over his left shoulder, Kizmaru reached into his pouch where he kept his projectiles, grabbing two shuriken and letting them loose in his opponent's direction. He didn't expect much from throwing those shurken but it would at least provide him with a bit of cover. Immediately after throwing them, he'd closely follow behind them, moving a moderate pace of up to eleven meters. He was closer now, only a meter away but he wasn't ready to attack just yet. Instead, he would wait to see what his opponent would do and try to counteract it. He wasn't sure if he wanted to take the frontal assault quite just yet so he would have to be on guard and wait for the perfect chance. He also assumed that his opponent was stronger and faster than he, himself was and couldn't risk doing anything so brazen. Takao's eyes narrowed as he watched his opponent, axe in hand, retrieve a pair of projectiles from his pouch. No sleight of hand, seemingly no tricks up his sleeve, just a normal pair of mundane throw-ables launched his way almost lazily. He had prepared to react as soon as light hit the polished steel, coal hues tracking the flight path as soon as they left his opponent's hand. Takao's right hand rose and, before the shuriken could collide with his flesh, the rings of the projectiles were caught between his digits. His gaze swapped, watching his opponent who had run after the projectiles and whom Takao had seen doing so, obviously, when watching the shuriken. With his hand outstretched, he maneuvered both shuriken into the palm of his hand, slowly curling into a fist. "That was a very weak opener," He commented monotonously. As his digits curled, the metal of the projectiles twisted and folded under the force of his grasp, leaving an unusable mangled modern art piece behind. "Come on now, surely that isn't the best the Hidden Stone has. Throwing the first strike is an excellent opportunity to set the pace of the fight to be in your favour." His fist opened and the crumpled shuriken dropped unceremoniously to the ground, clashing shrilly against one another as they came to rest in the dirt. Perhaps it was unbeknownst to his opponent that this distance, a mere arm's length away, was the worst place for him to be. Perhaps yet his opponent had something planned. 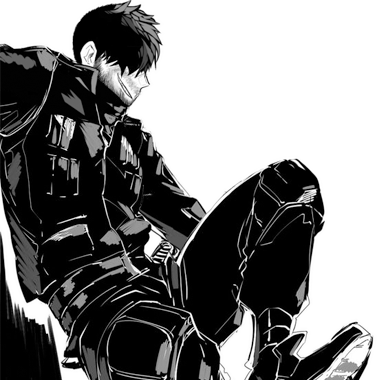 Takao's hands slid into the depths of his trouser pockets, standing with lax posture and half-open eyes that bore down at his opponent who stood a mere meter away, he radiated the confidence that he could handle whatever the Chūnin may have had up his sleeve. "You're welcome to try again if you'd like. Here, I'll even close my eyes." Takao said, raising his hand from the pocket to cover his eyes. He peeked between the digits, briefly, before covering them completely again. Kizmaru watched as the man effortlessly caught the shuriken. "No surprise there", Kizmaru thought to himself. He could have sworn he heard the man say something but he paid no mind to it as he was in a fight and he needed all the focus he could muster against somebody with a clear advantage over him. Continuing to watch the man, he witnessed him begin to crush the shuriken he had thrown, between his fingers. Amusing, Kizmaru had thought to himself. So this is a Jounin from a different village, eh? Now, the Jounin had something very peculiar to say. The best the hidden stone village has to offer? Far from it. After all he was a fresh Chuunin and was still growing. While his opponent continued to talk, Kizmaru had an idea. He dropped the axe he was holding and hopped back a meter. He figured if the man had caught him with strength like that, he'd stand no chance. He still wasn't ready to use any of the offensive jutsu he currently possessed, since he only had three. Instead, he would enter his taijutsu stance and close in on his opponent. Kizmaru's stance was a very basic one, consisting of two open palms and bent knees signifying his preferred method of hand-to-hand was grappling. He had no choice now but to go in for close combat. At this point, Kizmaru hadn't heard what the man had said since he was somewhat worried about how to approach. He had heard bits and pieces about the first attack sets the pace but at the same time, thought back to his battle with Teiho how recklessly attacking first would cause him to fall into a continuous loop of misfortune. Most of the opponent's he's fought so far were mainly defensive up until this point and Kizmaru had figured this one was the same. Traveling the two meter distance, Kizmaru outstretched his right arm and latched onto his opponent's collar, simultaneously grabbing onto their right wrist and holding it onto it to restrict its movement. Kizmaru then rotated his waist counter, shifting his right leg behind his opponent's own right and pulled him towards the ground. For some reason, the man had his eyes covered but Kizmaru paid no mind to that since he assumed he had other ways of tracking him. Continuing the assault, Kizmaru would let go before his opponent hit the ground, following up with a swift punch to the abdomen when his opponent hit the floor. Unsurprisingly, Kizmaru had opted for distance. A smart choice, but not taken far enough, at least from Takao's perspective. The axe was discarded as well. Perhaps not a smart choice, as the axe added an additional element to the battle that could've been used in his opponent's favour. Again, merely a musing from Takao's point of view. Nobody knew how to beat him better than himself, after all, but the axe was largely a negligible element regardless. Perhaps the most interesting part of all, his opponent had refused to take the free shot. Exhaling a sigh as he heard Kizmaru bounce another meter away, his hand dropped, sadly. "They never go for the free shot." He pouted. Moreover, it seemed as though Kizmaru was entirely uninterested in the banter. Truly a shame, the outcome of the match had been decided from the start, so he had hoped that they could at least have a bit of a back and forth. Oh well, he mused. He couldn't force his opponent to enjoy the fight as he did, after all, so there was not much use in dwelling on the matter. Then in a sudden burst of motion, Kizmaru closed the distance he had only just created between them and sent both hands outstretched for Takao. One on his collar and one on his right wrist, to which Takao stood idly by and let happen, up until that point. The fabric of his shirt gave but the body within hardly moved at all. With both of his opponent's hands so graciously occupied, Takao's unoccupied left fist rose quickly, shooting straight for his opponent's celiac plexus, a fairly uncomfortable cluster of nerves to leave wide open with the attempt at a grapple. With his opponent's actions properly interrupted, and assuming that the quick, gut-bound jab for the boy's unprotected solar plexus struck true, Takao would utilize the opportunity granted by this simple action and spin counter-clockwise to his opponent, picking up momentum in his hips to aid in the back-kick that was aimed for his opponent's sternum. Neither strike was meant to put him out of commission, at least not intentionally, but it remained to be seen what kind of abuse his opponent could withstand. "I don't think you're gonna win in close quarters. Why don't you back off and try using some jutsu?" He commented, imparting another steaming nugget of advice onto his opponent. The situation was becoming dire. In a fell swoop, Kizmaru was struck at a specific part of his chest which promptly caused him to fall to the ground, taking a knee, lowering his head and clutching his shirt where he had been struck. izmaru wasn't ready for the power that came from his opponent's strike but now his body had acclimated. He was positive this wasn't his full strength but as long as he struck him with half-hearted attacks like this, he should be able to endure for a couple of minutes. Kizmaru hadn't known this but, collapsing onto the floor allowed him to narrowly avoid the incoming back kick that was thrown. Kizmaru had only looked up, gritting his teeth from the sharp pain he had felt recently to catch a glimpse of it passing over his head. Still, if he acted now, maybe he could get a shot in. Quickly, aligning his left shoulder with the leg his opponent used to perform the back kick, while his opponent was off balanced, pushing up off the ground while performing one-handed seals of Snake, Ram, Monkey, Boar, Horse and Tiger with his right hand. Curling then clasping his left arm around the opponent's leg between his shoulder, neck and left bicep, Kizmaru had inhaled before blowing out a stream of flames from the chakra he had kneaded in his body in the direction of the his opponent. Hopefully, this would would grant him enough time to hold his opponent in place, even for a mere second, and deal a solid blow to him. Kizmaru thought it was an interesting choice to perform a back kick so close to each other despite practically being a few centimeters away. Either way, he was glad that he was given an opportunity to retaliate like this and he wasn't about to squander it now. "If you're going to leave yourself wide open like that, you should at least be able to take a hit, don't you think?" The point of this match had long since escaped him. There was no joy or entertainment to be gained on his side, and he doubted the humiliation of a complete defeat, nor the challenge of an opponent he had no chance against would be much fun for his opponent, but persevere through the odd circumstances he did all the same. At least, following the slight against Kizmaru's midsection, he seemed to listen to the advice Takao had given him. His opponent cast a technique using only a single hand, an interesting feat surely. As he did so, he grappled Takao's firmly planted leg between his shoulder and bicep. Takao watched, recognizing or at least making assumptions based on the hand movements on what sort of technique might be produced. At this range and in the current predicament, it would be a difficult task indeed to dodge. So instead, he inhaled and exhaled in the time it took Kizmaru to finish. The flames that Kizmaru produced, as they were produced, were caught in the web of chakra Takao had released from his lungs. As Kizmaru exhaled, Takao inhaled, drawing the flames that Kizmaru cast into his own lungs and nullifying them completely before any harm could be done. Surely he could have cast his own fireball technique, but with his opponent so close, it may have harmed him in the process. When Kizmaru finished, Takao exhaled a plume of black and grey smoke from his nostrils. "That was kind of... awkward. Just for the record, that doesn't count as some indirect kiss or anything. I'm already taken." He said, clicking his tongue twice. "Why don't you try some distance this time? Maybe use something that isn't so direct and telegraphed-- a distraction could work, or some kind of feint. The substitution technique or transformation techniques are good tactics if you use them cleverly." Description: Devouring Divinity is a basic ninjutsu technique designed to consume and defend from incoming jutsu. The user completes the hand seals and exhales a pure chakra projectile approximately 2-meters in diameter in a straight line in front of them, travelling 10m/s up to 10-meters away. This projectile is capable of stopping the momentum of an incoming jutsu and pulling the chakra out of it; in the event of intangible elements such as fire or wind, the user consumes the element and nullifies it within their body. For physical elements, the user pulls the chakra from the attack and nullifies it that way. Regardless of the method used, the user is capable of consuming and nullifying up to 1 technique of equal rank or lower. Additionally, after a technique has been devoured, the user may reduce the cooldown of a single Ninjutsu technique by one post.